HighLow is a brokerage based in Sydney, Australia, and the company is regulated by the ASIC (Australian Securities and Investment Commission). The HighLow offering includes a demo account with a “no deposit, no sign up” option. This is perfect for beginners to try out trading, and to find strategies that work for them, and to develop their trading style. The trading platform on offer for HighLow traders has many of the familiar features you will find across other platforms. However, there are some unique options that make this platform stand out. The screen is easy to navigate, with tabs along the top of the screen showing expiry times for trades. The left-hand tab allows users to search for assets and markets to trade in, and there is a favorites area for finding most traded assets. The main chart updates with the latest market prices once an asset is selected, and also on display is trader sentiment and the countdown to expiry for placing a trade. The platform is easy to use, with clear trading buttons and the option to change trade size and select trade direction. A great function is the price graph, which will display the direction in which the market has to move for trades to be successful. This is especially helpful for beginners, and helps reduce first-timer mistakes. The options for depositing money into a HighLow trading account are varied, and users can be reassured that funds are held in a separate trust account, not in the company bank accounts. Wire bank-transfers will clear into accounts the same day, as will credit card and Neteller deposits. Other payment methods may be subject to delays. 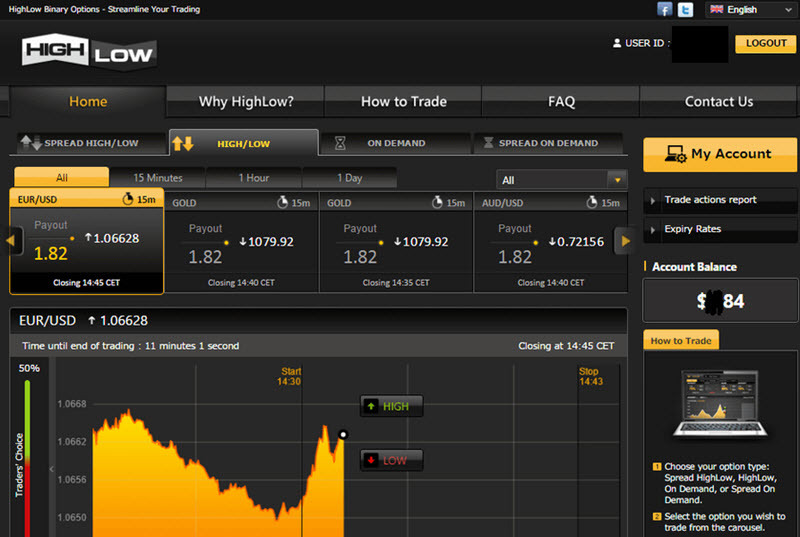 HighLow offers free withdrawals and quick processing times, and this has made it a popular choice among traders. There is an extensive FAQ section on the HighLow website, as well as a Resources section. This is usually all you will need to find the answer to any question that may arise. If the answer can’t be found on the website, HighLow offers customer support via telephone or through the Support Ticket online contact form. The superb demo account, with no sign up or deposit obligation, is something that attracts users to the HighLow website. Beginners can try out all the trading functions, and get to grips with the trading platform. Due to the excellent features on offer, and quick and easy trading, traders of all levels of experience find this a great option for online trading. The many deposit options ensure the company has the method you prefer, and with fast, free withdrawals, the service just keeps getting better. HighLow is a regulated trader, and the fact that they keep user account funds in a separate trust fund adds another level of reassurance to investors.